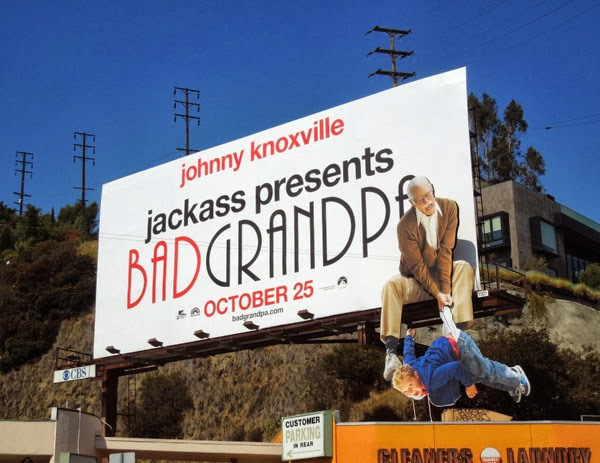 Johnny Knoxville is back on the big screen this fall courtesy of his Jackass crew, and they have a few tricks up their sleeve to grab your attention. 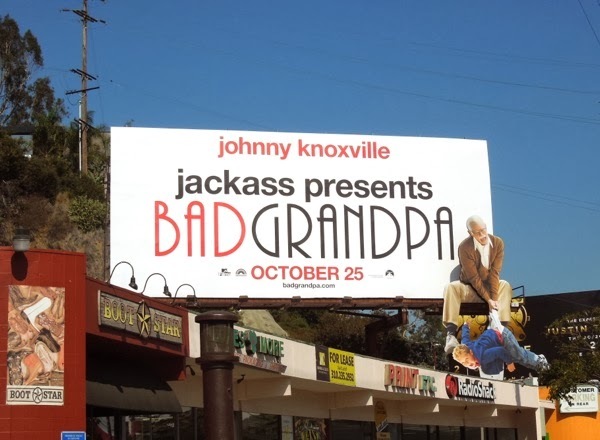 Knoxville stars as quite possibly the worst grandparent in this new comedy and under prosthetic makeup he's transformed into 86-year-old 'Irving Zisman', and from the looks of these fun billboards he's someone you shouldn't really leave your kids with. 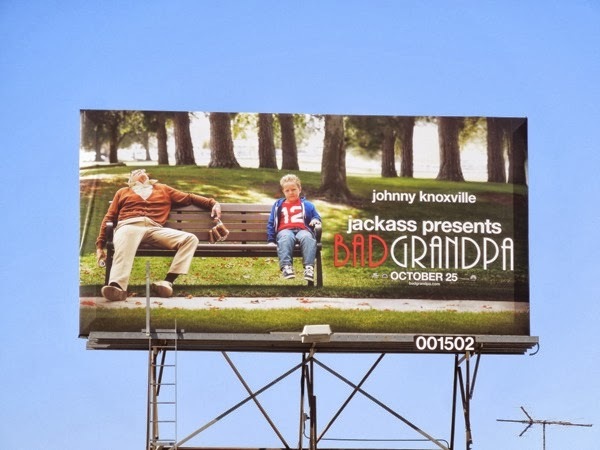 And this time around there's a semblance of a plot to hold all the outrageous stunts and often painful pranks together, as Irving is tasked with taking his grandson 'Billy' (Jackson Nicoll) on a road trip across America to deliver him to his father after his mother is incarcerated. 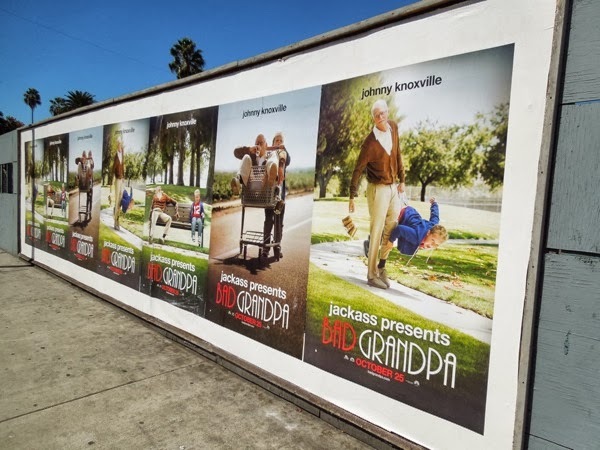 It'll be an interesting experiment to see if the story will be able to hold all the hidden camera stunts together, but one thing's for sure, this hilarious ad campaign certainly will do the job of conveying the comedic plot of the movie and get bums in seats in the cinemas. 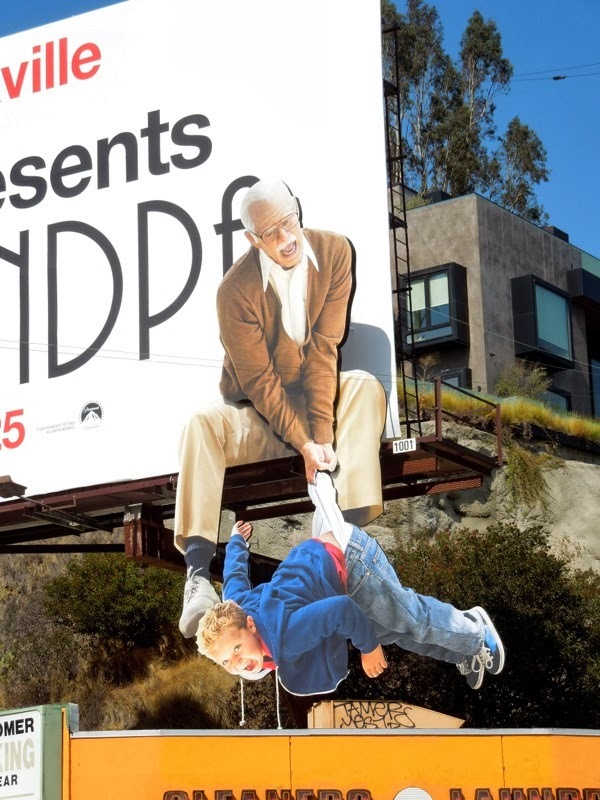 One of the best of the lot is obviously this 3D 'dangling kid' special installation with the geriatric holding onto his grandson by his underwear, giving him the ultimate wedgie, which really stands out along L.A.'s Sunset Strip where it was snapped on October 1. The aging Irving definitely doesn't seem like the best role model and he kind of looks like a drunken 'Stan Lee' (the iconic Marvel Comics legend). 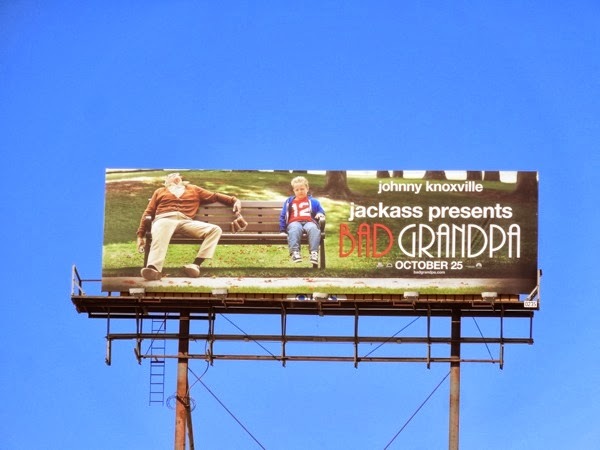 One of Daily Billboard's all-time favourite billboards from the last five years was the crashed jet ski billboard installation for Jackass 3D back in October 2010, which was a truly spectacular PR stunt. 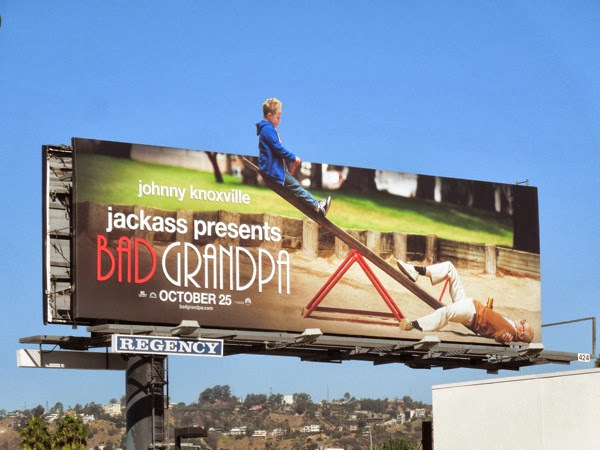 Daily Billboard also liked the dynamic Jackass 3D jet engine special extension billboard and wince-worthy Jackass 3D charging bull billboard. 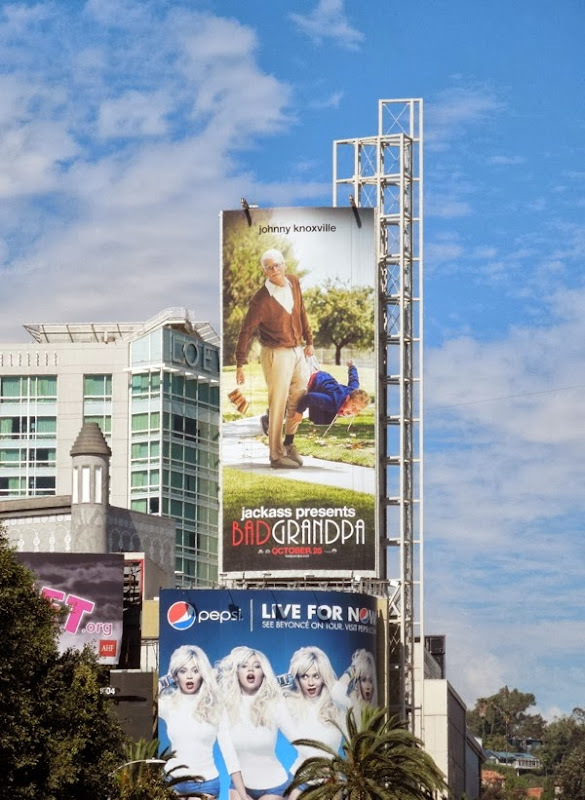 This is an equally impressive and eye-catching out-of-home campaign for Bad Grandpa and the 'seesaw' special extension billboard was spotted along Melrose Avenue, whilst the 'drunken park bench' creatives were snapped along Sunset Boulevard and Wilshire Boulevard on October 5. 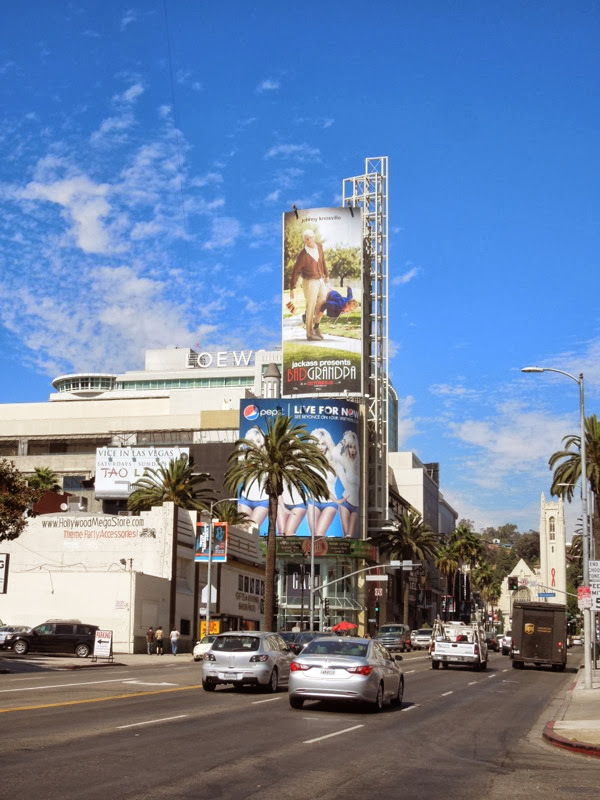 In addition the portrait ad creative was captured towering over Hollywood & Highland on October 7, 2013. What do you think of the ad campaign? 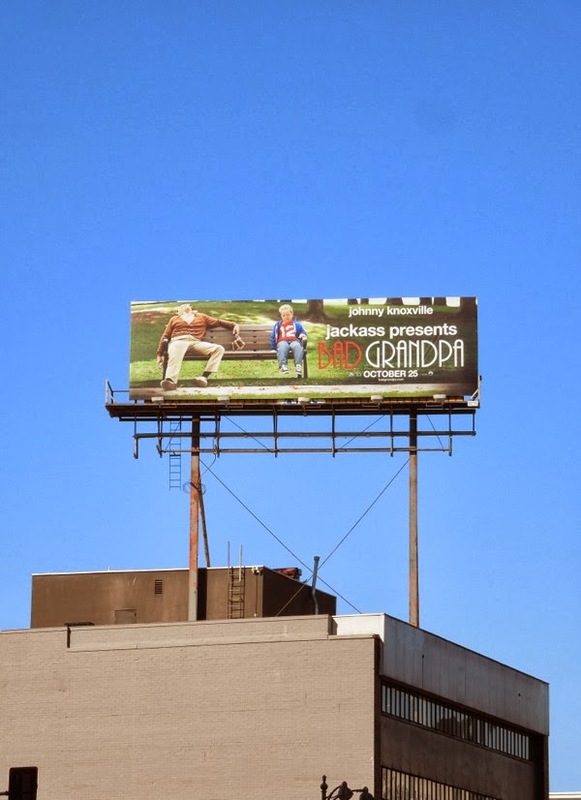 What's your favourite billboard creative? 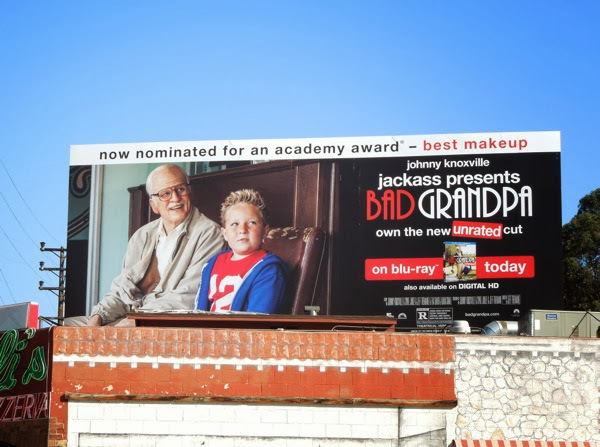 UPDATED: Who'd have thought that Bad Grandpa would ever be nominated for an Oscar? 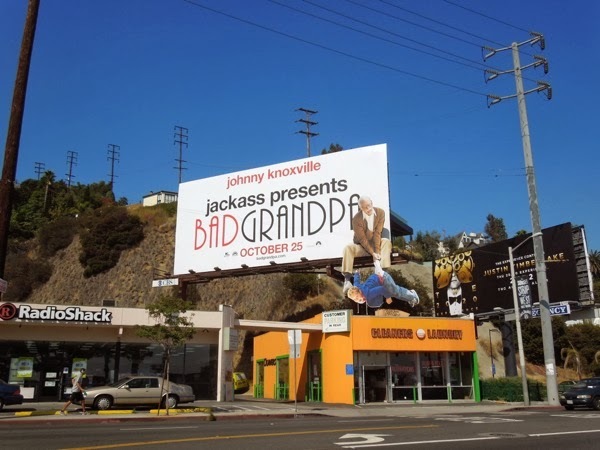 However the Jackass comedy movie, and Stephen Prouty specifically, has been nominated for the Best Makeup and Hairstyling Academy Award (alongside Dallas Buyers Club and The Lone Ranger), for transforming Johnny Knoxville into the troublesome octogenarian. 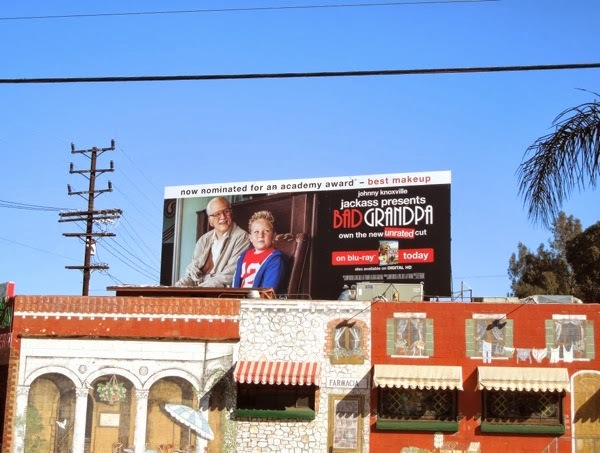 Here's the joint Blu-ray and Oscar nomination billboard for Bad Grandpa spotted along Cahuenga Boulevard at Regal Place on February 21, 2014.